Knitters and crocheters often seem to operate in different worlds. People usually know one yarn craft but not the other, or they much prefer one so they only know enough of the other to get by. Rare is the person who really likes both and does both well. I’m definitely a knitter and I can crochet enough to get by, but I want to improve my crochet skills this year. I’ve been working on a crochet project for the girl’s school and it’s got me thinking about working with crochet a little more. Whether you’re a knitter who wants to learn a little crochet to be able to use both techniques in a project or someone who doesn’t knit but still wants to learn to crochet, this series is for you. 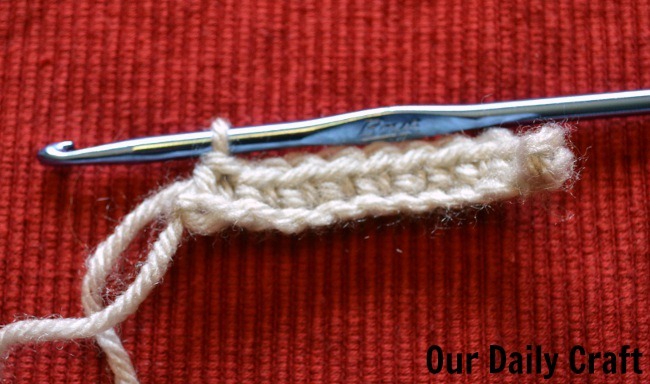 Today we’re going to cover the most basic parts of crochet: chaining stitches and forming the single crochet stitch. Of course we know that knitting is two (or more!) 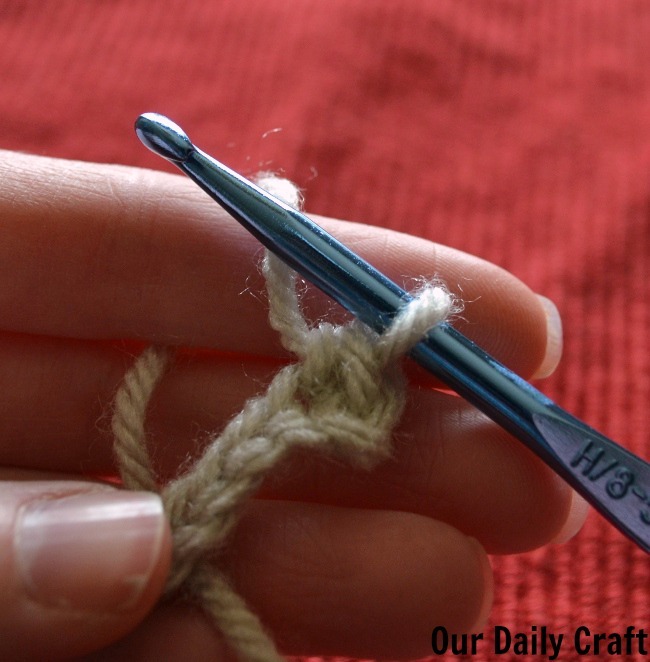 needles and crochet is one hook. Many Americans and others around the world learn to knit by holding the yarn in the right hand, but in crochet you hold the yarn in your left hand as you go. 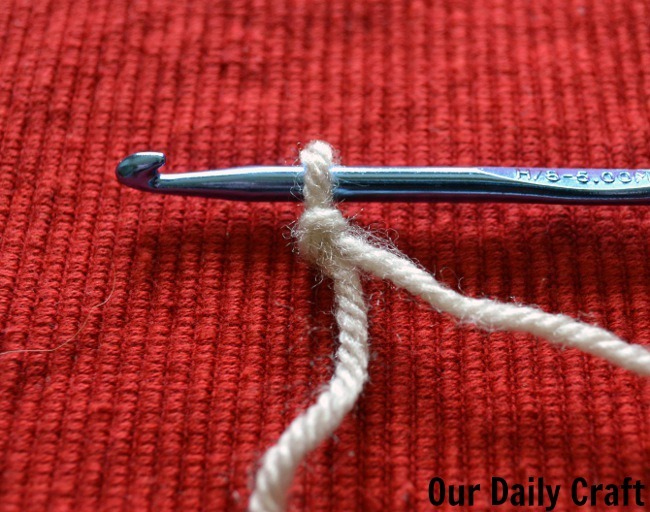 I’m convinced this makes learning to crochet easier for people who already know how to knit continental; in fact, I tried for years to learn how to crochet and couldn’t get it until I learned to knit continental. So if you’re a knitting having trouble learning crochet, see if you can try knitting with the yarn in your left hand. 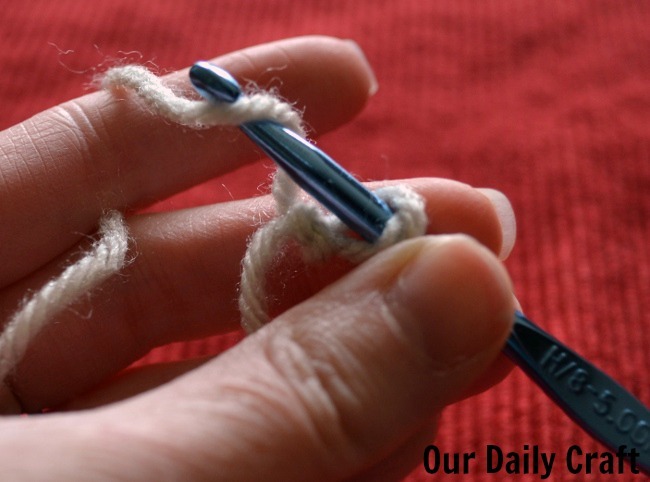 It should make the yarn manipulation part of crochet easier for you. The chain is to crochet what casting on is to knitting. 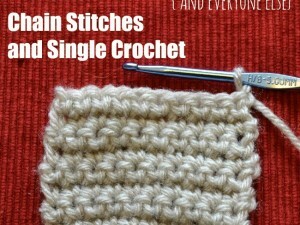 It gives you a place to build your stitches on and is the basis for whatever you are crocheting. Chains are also used to make space between other stitches, but this kind of chain, known as the foundation chain, is all you need to know right now. 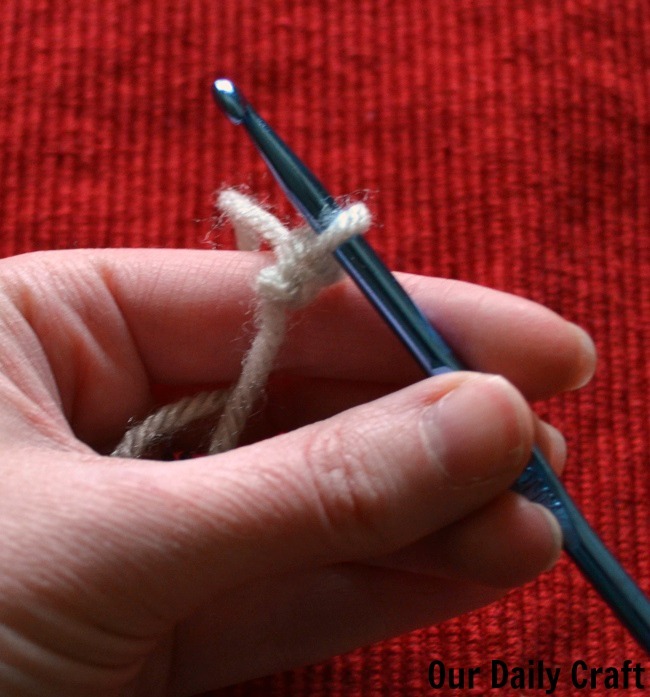 And, like in knitting, the crochet chain begins with a slip knot. 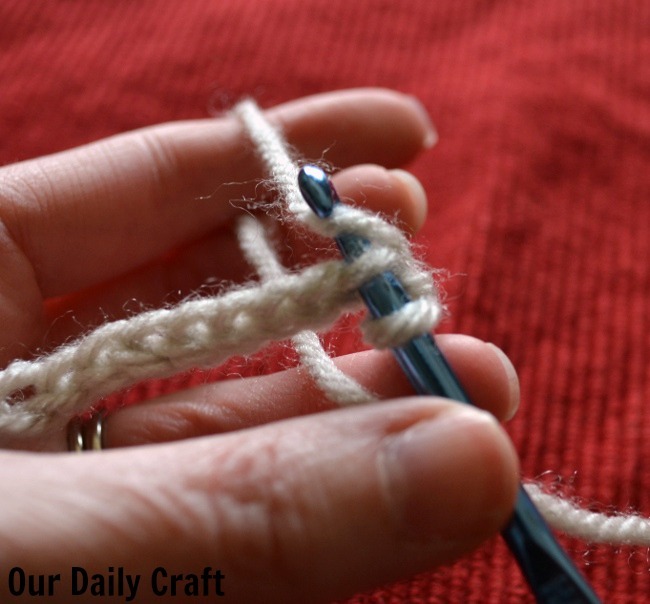 Once you have your knot, take the yarn over the hook. Pull through. You have now chained one. 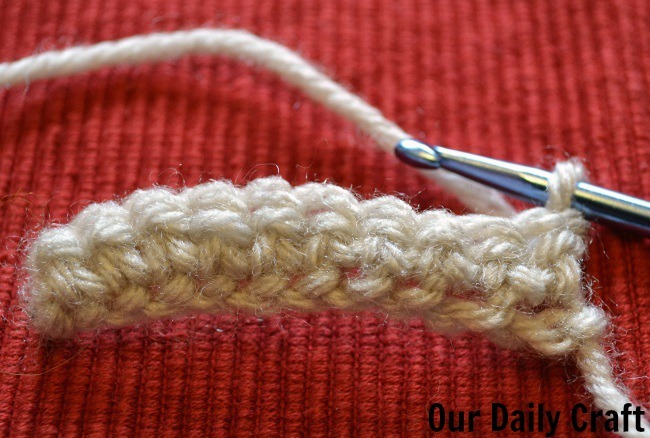 One interesting thing about crochet is that you need to chain one more stitch than the number of stitches you intend to crochet with, and the slip knot does not count as a stitch. So, to begin the little sample shown here, I chained 11 so I would have 10 stitches to work with. The reason you chain an extra stitch is because you skip the first chain that’s closest to the needle. The reason for that is because that’s where the working yarn is coming from, so if you try to work there you’ll just end up with an elongated mess. 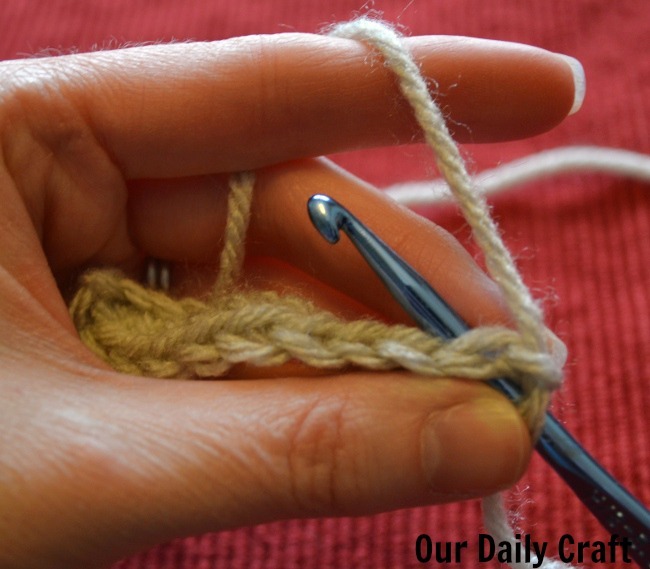 For the first row of single crochet, put your hook into the top or back (however you want to look at it) part of the chain that is the second chain from the hook. They sort of look like the Vs of knit stitches, don’t they? 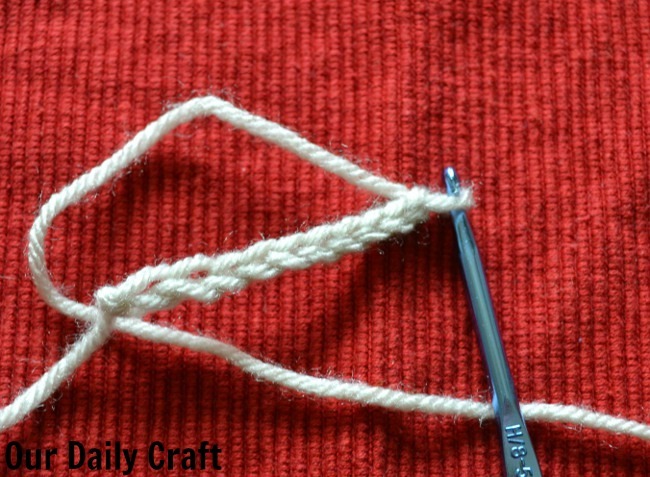 Bring the yarn over the hook and pull through so there are two loops on the hook. 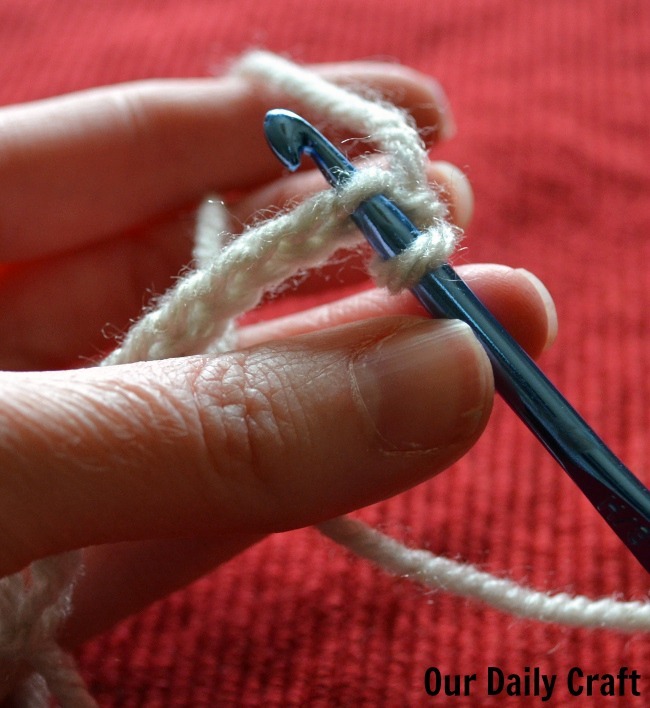 Bring the yarn over the hook and pull through again so there is one loop on the hook. 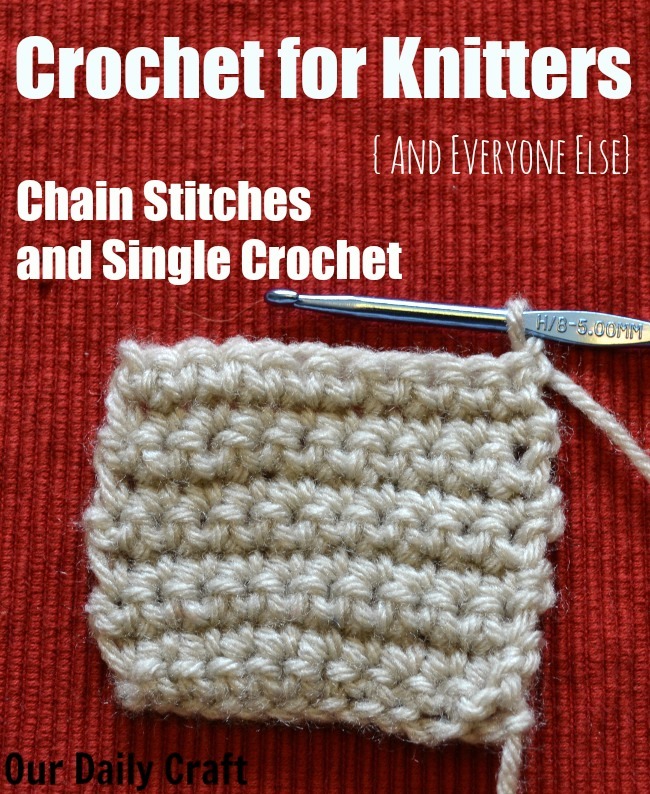 You’ve made one single crochet stitch. Do this same thing in the next stitch and the next so on down the line. You might want to count to yourself as you go to make sure you still have 10 stitches when you get to the end. For the second and all subsequent rows, instead of just going through the top/back part of the chain you go through both parts of the stitch — unless your pattern says otherwise. And again, skip that chain that’s closest to the hook. 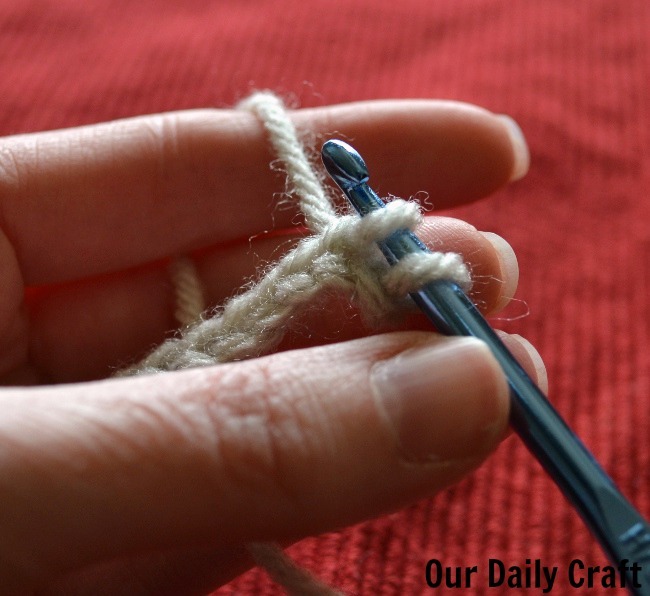 Once you’ve got the hang of it, you might want to try a project that uses single crochet so you can get really comfortable with it and build up your speed. 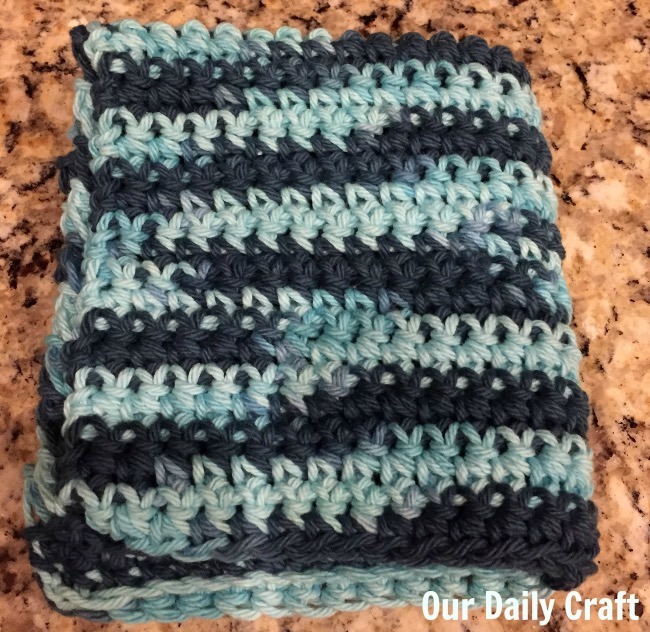 This single crochet washcloth or dishcloth is a great place to start. I crocheted mine in just a few hours, and used a whole ball of yarn (one advantage crochet might have over knitting is in stash busting — projects tend to go faster and use more yarn). If you’re a knitter, you probably already have some kitchen cotton in the house (mine is a ball of Peaches & Creme in Teal Ombre). Grab a ball and a size 8 US/H crochet hook. Chain enough to make roughly the size you want — I did 31 — then just single crochet those 30 stitches over and over until your piece is square or you’re about to run out of yarn, whichever comes first. 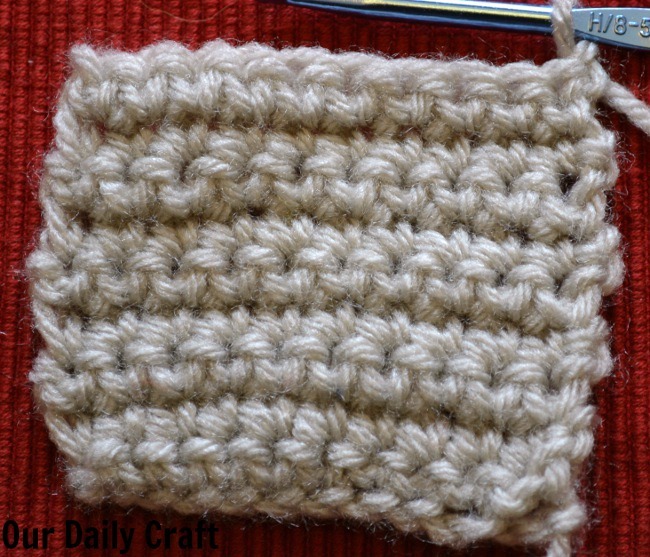 I hope you’ll give crochet a try and I’d love to hear how it turns out for you. And if you are a knitter and you have questions about crochet, I’d love to hear them for future posts.